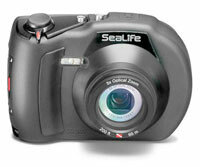 Available for hire at PLANULA is the Sealife DC1200 digital camera. For $50 you will get to take this camera for the day and we will burn all photos you took underwater onto a CD as an everlasting memory. Want to have one for yourself? Try before you buy! We sell a large range of Sealife, SONY and Olympus cameras with their underwater housings and loads of accessories. From wide angle and macro lenses to strobes, silicon grease, silica gel, o-rings and lens cleaning kits. Tim can go out diving with you and video your dive using the latest digital videographing technologies. Individual movies can be edited on-site to become an everlasting memory. A fully equipped non-linear editing studio is on-site. Visit the filming section of our Video Productions website for more info. In 2005 we released MARINE PASSIONS – an amazing new DVD with breathtaking underwater imagery from Byron Bay set to a seductive soundtrack by Bhakta and Disha. You can buy a copy of this awesome DVD on underwater.com.au. PLANULA is also an official retailer of Ikelite, Top Dawg, 10bar and other underwater housings as well as Sea&Sea products, Sealife cameras, SONY, Olympus and more. More info on on that on our Planula Photo & Video site.